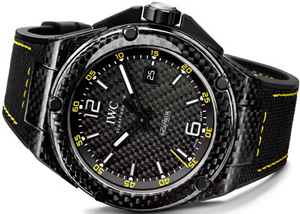 At the annual SIHH watch fair in 2013 the legendary watchmaker IWC introduced a collection of gorgeous models Ingenieur. Each model in the line is original in its own way, due to the different materials from which they are made. Watches Automatic Carbon Performance (Ref. 3224) – this is a great sport style, new design that combines black and yellow. Body made of carbon fiber, has a black bezel, attached five screws. This design is made in the image of the driver cell (monocoque) and the body of the famous race car “Formula -1» TM. In the process of manufacturing carbon fiber impregnated with epoxy resin, pressiruetsya then goes into the oven. Here at high temperatures under pressure the material is durable. Carbon has long been a feature of “Formula 1» TM and is a symbol of impressive innovations. Using this material, not only for the individual components, but also for the whole body of new items Ingenieur Automatic Carbon Performance, brand IWC Schaffhausen emphasizes its image watch manufacturer of the highest quality. Another model from the collection – Ingenieur Automatic AMG Black Series Ceramic (Ref. 3225) – the embodiment of many years of cooperation between IWC and AMG. Pottery, which is used in motor sports, the company has opened for IWC watch industry in 1986. Other material, titanium was used brand in 1980. It is made out of this material new Ingenieur Double Chronograph Titanium (Ref. 3865). The owner of this watch can easily measure the time of the road, thanks to the split-second chronograph double arrow. Complete line of sports watches Ingenieur Dual Time Titanium (Ref. 3264). Team members MERCEDES AMG PETRONAS Formula One ™ Team easily oriented in time when crossing time zones, thanks to the pointer a second time zone.